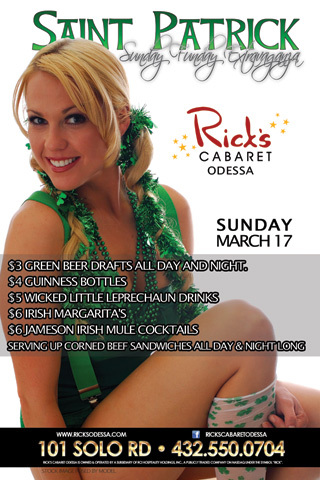 Rick's Cabaret - Odessa - March 17 - St. Patrick's Sunday Funday Extravaganza!!! St. Patrick's Sunday Funday Extravaganza!!! Typical St Patty's day Party. Green beer and all. We will have prizes and giveaways. Cardboard cutouts of leprechauns for a fun photo opportunity.